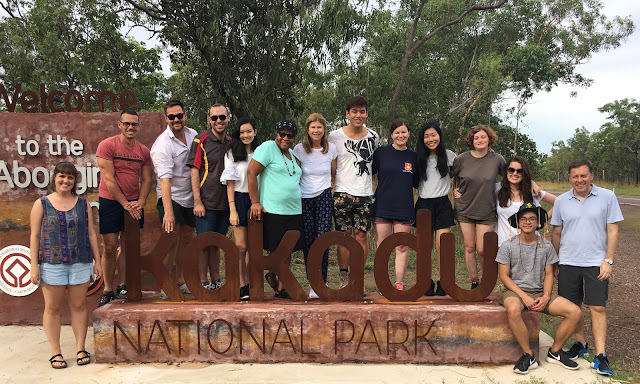 Recently a few of our students travelled to Kakadu National Park in the Northern Territory, as part of their Service Learning in Indigenous Community (SLIC) coursework. This new service learning program is one of several across New South Wales and the Northern Territory that seeks to provide innovative learning and teaching outside the classroom, whilst tackling real-world challenges faced in these rural communities. Tell us about your experience in Kakadu? How did you find Service Learning compared to learning out of the traditional classroom? You must have an elective Commerce unit available to apply for this program. Interested students who are enrolled in a Business School degree must check their eligibility before applying. Send an Expression of Interest to business.placements@sydney.edu.au including name, SID and degree enrolled in and include ‘SLIC’ in the email title. Learn more here. Vince Lam and Lisa Tu, current Bachelor of Commerce students and Lisa Kha, current Bachelor of Commerce (Liberal Studies) student at the University of Sydney Business School.